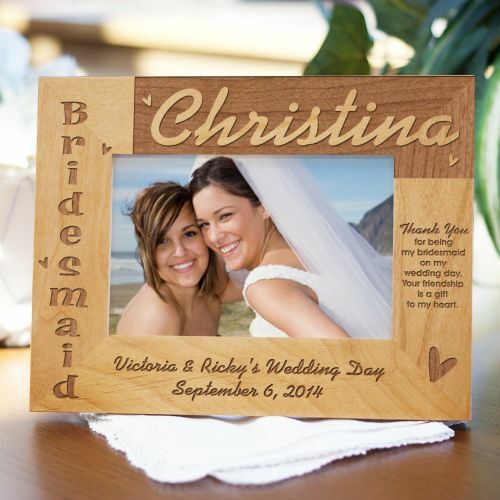 Personalized Engraved Bridesmaid Wedding Wood Picture Frame. The bridesmaids help make your special Wedding day a truly remarkable event which you and your family will cherished for a lifetime. Remember the moments your bridesmaids gave you so much support on your wedding day. Thank all your wonderful bridesmaids with an beautiful Bridesmaid Picture Frame with their names laser engraved. Picture frame is perfect in holding your special photo and make the perfect family keepsake. Picture Frame perfectly blends in with any home or office desk or table decoration. My family & Friends love the Picture Frames. My family did not event think they have Wood Photo Frame Personalized. They was surprised.. I have ordered 10 Bridesmaid's Picture Frames, 6 Flower Girl Picture Frames, 6 Sister's Picture Frames, 2 Wedding Couple Picture Frames (For Me & new Hubby) 4 Family Name Picture Frames (For the new family Name) Mr. and Mrs. Wedding Glass Picture Frame, 2 Wedding Last Fling Picture Frame, 2 Girls Night Out Wood Picture, Groomsmen Wood Picture Frame, & Is Her Daddy Wedding Picture Frame .. I have all these New Photos but no new or beautiful Wedding Picture Frames. All the Photo Frames came in fast. It was professional made.. I love the Photo Frame & My Family.. I recommend my family to come shop here too. I ordered 8 Personalized Bridesmaid Photo Frame Keepsake Box for my friends. 4 Maid of Honor Photo Frame Keepsakes & 12 Wedding Wood Frames. I love it, So much. It was a big order but it was the best. It was shipped fast. Very professional wood frames & keepsakes Boxes.. I did ordered my wedding gift 6 weeks in advance. So I did not need it to be rushed at all. Everything was perfect. I also come back to order some designer luxury Wedding Glasses too which was perfect & professionally made. Luxury Wedding Glasses... It was too Upscale Wedding Glasses but it was the talk of the Bridesmaid's, they love it. This store is big too many wedding gifts. Later I found out they had Wedding Tapestry Throws too. My sister ordered too a week later Personalized Wedding Doves Inspirational Tapestry Throw for me. I love it I was amaze they had Tapestry Throws too. Well, I have made alot of Pins to my Pinterest Pins for my Wedding Gifts for my friends.